Okay, so this is harder than I’d thought it would be. I guess being a “90-percent locavore,” I assumed the other 10 percent would come easily. What I’m learning is that locavorism is a lot like weight loss: It’s much harder to lose the last five pounds than it was the first 45. Not that any of it is easy, but that last few steps has really made me note where I’m coming up short. In some cases, this is truly not my fault. For example, yesterday’s (Day 5) Daily Challenge. I don’t really use a mobile device (I have a tablet that I take for onsite meetings for notes and such, but I’ve downloaded surprisingly few aps… as it’s not an iDevice, perhaps it’s not so surprising after all). Thus, it really isn’t easier for me to find local food by downloading an app. I cannot even mince this one, unless it is to say that I did make note of the websites NOFA-NY recommended: Shareable.net (not particularly helpful for the Challenge, but definitely a cool website to explore in the future) and Greenopia (very good; the link goes to NY, but you can match up to your locale in the dropdown). All in all, however, I have to say that I did not complete the Daily Challenge. Which brings me to the FotD: Cheese. Now, normally, this is pretty much a non-issue for me. With a few exceptions (noted in the nachos yesterday), I don’t generally buy commercially produced (and packaged, ew!) cheese. I prefer artisanal cheese, and if I cannot afford it (much more expensive as compared to the grocery than, for example, meat or factory organic), I simply go without. However, “artisanal” does not mean “local,” and even though I tongue-in-cheek asked if New Jersey (10 miles away) is more local than upstate NY (anywhere from 30-300 miles away), NOFA understands that it does not represent Texas or Montana. To them, “local” is defined by 250 miles. Well, the cheese I had in my charcuterie (ha ha, no cold cuts in my fridge!) drawer hailed from Plymouth Artisan Cheese, just about 10 miles beyond that 250-mile radius. Now, of course, I could note that from the Bronx, I would be well within the “local” perimeter, but the fact that Plymouth is in Vermont and I, in fact, live in Brooklyn add up to one simple truth: I failed at getting local cheese as my Food of the Day. Can we switch the conversation up and talk about beer? A huge craft beer supporter (drinker and writer – yes, I make money writing about beer), I am actually enjoying limiting my beer intake to the radius, frequently not even stepping beyond the Borough, in which there are several amazing breweries (Kelso, Brooklyn, Sixpoint chief among them). In fact, if you want to talk local, I will soon be taking my very first homebrewing class at Bitter & Esters, another amazing Brooklyn beer business. While four days ago, I was bemoaning not having the Hitachino (Japan) that was tapped at my favorite growler shop, I was super happy to try an amazing beer I probably would not have gone for had I not been shopping local (price aside, I generally opt for Belgian sours over local): Captain Lawrence’s Hops ‘N Roses, a tart, oakey, fully flavored sour beer. 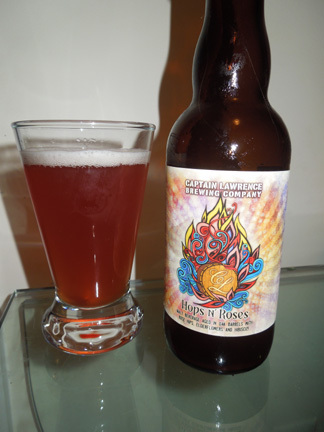 It was so yummy, I’m going to make a point to seek out some more Captain Lawrence brews as the Locavore Challenge continues. Where I Soared: I’m doing a bit better in the fat department, all beer belly jokes aside! I’m cooking more with butter, which is sourced locally and easy to find both at the greenmarket and the grocery. It’s been awhile since butter was my go-to for sauteing, and I’m happy with the results vis a vis less olive oil (yes, yes, I know that olive oil is not a cooking oil… please spare me the lecture). Where I Sunk: Have to be the mac & cheese. The macaroni was store-bought (hey, it was on sale! 99 cents for a pound… I bought two boxes), and the aforementioned cheese slightly out of bounds. The ham and kale I chopped up, sauteed (in butter!) and added in probably doesn’t make up for the basic non-locavore meal (it’s called mac & cheese, not “kale & ham”). My Grade: Maybe I’m being a bit harsh on myself, but gonna say, C+.